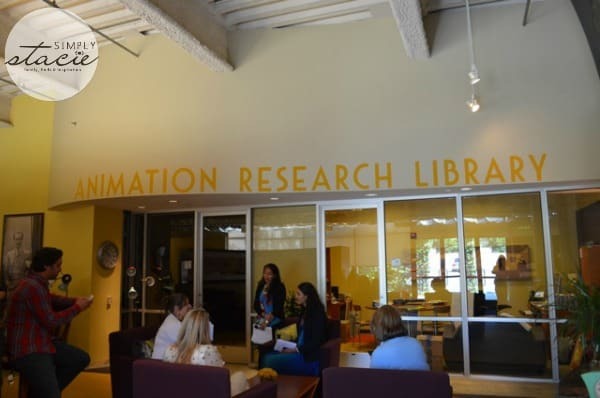 What is the Walt Disney Animation Research Library? The Animation Research Library is a building in an undisclosed location in California that houses a treasure trove of Disney concept art, story sketches, animation drawings, layout drawings, and background paintings dating all the way back to the 1920s through current day. It is estimated that there are sixty-four to sixty-five million pieces of art stored in this building. 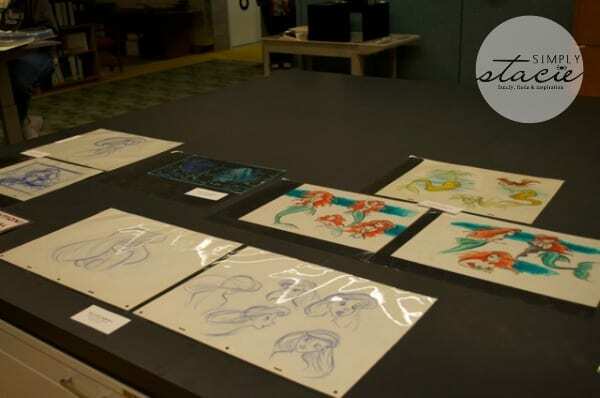 The purpose of the Animation Research Library is to preserve the artwork to provide inspiration to current and future artists, and to give Disney company personnel reference points for anything they might currently be working on. How is the art preserved? Fox Carney, the research manager at the Animation Research Library, gave us a tour of the facilities and explained the methods taken to ensure that future artists have the most efficient access to the art work. They use “museum quality handling standards” and are actually “digitalizing major portions of the collection,” Fox explained as he took us to the very area where the digitalizing process occurred. Two cameras are used to capture images of the art work. One of the cameras was repurposed and altered to work in a similar manner as a digital camera. While it suits the needs of the research library just fine, it actually takes about two minutes for the camera to take a picture. Because of how much time this takes, they have been focusing on the more fragile pieces of art that they own first. In a typical work day, only about one hundred pictures might be taken per day. A second camera in the image capture area was described to us as a P-65. Whereas the first camera we were shown operates slowly, the P-65 can copy an image in seconds. It’s estimated that twelve or thirteen hundred pictures can be taken per day. Once the camera captures the images, the quality control department checks everything out to make sure there were no errors in the digital transfer. They use automated reports as well as check each image manually. We were shown rough animation from The Little Mermaid. Being able to see the beginning stages of Ariel under the sea contemplating life on land reminded me not only of how much I love this film, but also of how much time is spent getting these rough animation pieces to the finished product we see in our movie theaters. Having the art work digitalized on a computer screen is also a benefit to an artist who needs to refer to it; looking at a piece with just the naked eye is limiting. Having it in front of you on the computer allows artists to sort of experiment with the art. They can try to “emulate the style digitally,” if they wish. The digitalization of the art work also benefits the original, in that its lifeline will be extended because it will not have to come out of its storage as often. The beginning of August was my third visit to the Walt Disney Animation Research Library. I’ve spent time viewing art work from great films like Cinderella, Sleeping Beauty, and The Nightmare Before Christmas, but I was incredibly excited to see and learn new things about The Little Mermaid. 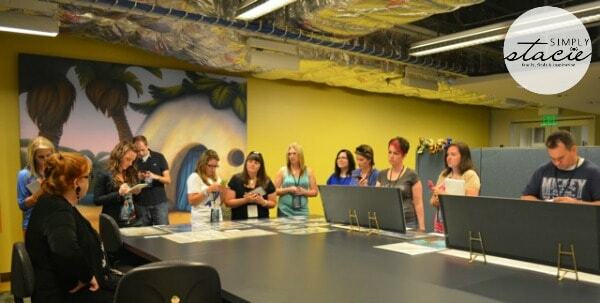 On a large table, sketches and concept art from The Little Mermaid were laid out for us to take a look at. Leading us through this part of our tour were Doug and Lella Smith. Lella is the Creative Director, and she’s spoken to us before about their budget and how they acquire the pieces they home in the research library. She talked a little bit about each of the concept drawings for the characters. What interested me most was the very different looks of Ariel and Ursula. Originally, Ariel was going to be blonde. The hit movie Splash, starring Darryl Hannah, had come out at the time they were getting started on The Little Mermaid, and the expectation seemed to be that all mermaids were blonde. For artistic reasons, they changed the shade of her hair to red because it represented fiery and spirited and also looked better against the blue ocean background. The concept art for Ursula was modeled after Joan Collins. Roy Disney did not like the look of her, and wanted her to be similar looking to an octopus to give her a more evil appearance. It was also said that once they heard Pat Carroll’s voice (speaking and singing for Ursula), they had a clearer vision of what Ursula should ultimately look like. What people may not know is that the voices (singing and speaking) are recorded before the animators begin their work. 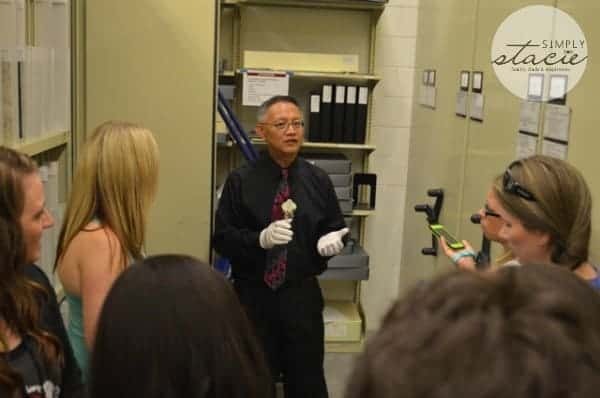 Even though California weather can get pretty hot, the employees at the Animation Research Library will wear long sleeves inside of the building—especially if they have to retrieve pieces from vaults. The vault contain rows and rows of carefully stored art work, as well as maquettes from Nightmare Before Christmas, 3D models from Fantasia, the actual marionette that Pinocchio was drawn from (there is also a photograph of Walt Disney holding the puppet on his lap), and the slabs of glass on which the Sleeping Beauty background is handpainted on—to highlight just a few of the pieces of art one will find here. I love visiting the Animation Research Library; I have learned something new and fascinating each time I’ve been there. One could seriously spend weeks—though probably even years—studying each of the pieces of art that live in this incredible building. Most of all, I loved being in the presence of some of the biggest fans of Disney. Doug, Fox, and Lella shared some wonderful personal stories about their favorite Disney films, as well as little tidbits of information I’d not known about other Disney shorts and feature films. Lella and everyone at the library are so blessed to be surrounded by timeless art that continues to inspire generation after generation. Disney’s The Little Mermaid: Diamond Edition Combo Pack is yours to own on October 1st, 2013. What an amazing and learning experience! Very cool! Thanks for sharing! Wow great post I really learned a lot. Thank you. Oh wow, this is cool! Thanks for sharing! This is one place I hope to one day get into. What a great experience to have! Thanks for telling us about it! This is so cool! So much has changed! Thiws must hqave been a real highlight for you.I wish I was able to see the creative proceess behind the completed film. WOW!!! That’s so awesome that you got to do this. Very interesting! what a cool experience! I love the little mermaid. OMG! That is awesome. What an experience of a lifetime. That is so neat!! I would love to go and visit this place!! I would love that since I am a cartoonist! I know someone that would thoroughly enjoy a visit like that! What an amazing experience! This library isn’t opened to the public, right? It would be something I would love to see one day! Very interesting and educational! Thank you for sharing your experience! The Little Mermaid is a classic! What an awesome opportunity! My family is headed to Disney in March and we can’t wait. We are planning on watching all the Disney movies to get ready for the trip. What a neat learning experience! My girls would enjoy this very much! How lucky to have the opportunity to participate in this experience. My granddaughter loves Ariel. Very cool!!! i would love to visit the vault and see the nightmare before christmas art work!